If you're in the market for a computer or server power supply, we at All Things Surplus have numerous models to choose from in stock. Our selection of computer hardware is vast, and we offer only first-rate products and excellent service. Regardless of our clients' needs, we can accommodate them by supplying contemporary, discontinued, and generally hard-to-find Power supplies. 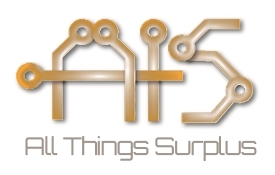 Whether you're looking to restore an obsolete desktop computer, or need a redundant power supply for a server, All Things Surplus has the products you require. From Intel, HP, Dell, Supermicro to Delta, we carry a number of power supplies for various systems and platforms. Our power supply inventory consists of server power supplies, redundant power supply, ATX power supplies, micro ATX power supplies, AT power supplies, and specialized power supplies. Some power supplies are difficult to find, as diminishing manufacturing sources and material shortages can cause products to become discontinued. However, All Things Surplus is a reliable source for both the obscure and popular power supplies and computer hardware you need.